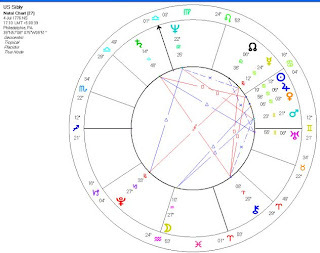 There are 2 ways of generating the US Sibly Chart, which is the chart most commonly used by astrologers. The usual way is to do a chart for 5.10pm on 4 July 1776 in Philadelphia. There is some evidence for a late afternoon chart but none, it seems, for a time as specific as 5.10pm. The other way the chart can be generated is by using medieval techniques to create a chart that signifies the Declaration of Independence. 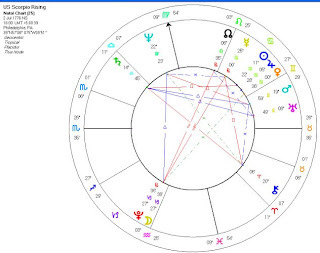 Susan Manuel showed in 1994 that if you take the House Cusps for the preceding Cancer Ingress of 20 June, set for Philadephia, you get the House Cusps of the Sibly Chart. If you then superimpose the planetary positions for 4th July 1776, set for 12 noon GMT, you get the planetary positions of the Sibly Chart. “Manuel showed that Sibly was working within the tradition, established by the great mundane astrologers of the Islamic world, in which it was not necessary to set a horoscope for the exact time at which an historical event took place (even the birth of an important individual), but rather to locate the horoscope which signified the event under consideration.” (Nicholas Campion, Book of World Horoscopes). Susan Manuel’s paper can be purchased here. My solar fire produces charts using this technique which are almost there, but not quite. Like I need to set the Sun at 1 minute of Cancer for the Ingress chart. And the Noon chart has the Moon some degrees out. But no doubt there are explanations somewhere for this. I'm not convinced that Sibly used these techniques, because the 5.10pm time also produces the chart pretty convincingly. But it still seems an eerie coincidence. I can’t say I understand these techniques, though it’s a fascinating way of going about things. In a way, I prefer it. Astrology is essentially a divinatory system that uses symbols, so a symbolic way of generating charts would in some ways seem more logical than trying to pin down birth times. 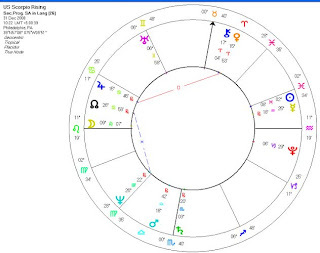 I guess the way you’d do it for your own chart would be to draw up the preceding Cardinal Ingress chart for the place you were born, and then superimpose the planetary positions for noon on the day you were born. I quite like my own chart done this way. It puts my Mercury-Uranus opposition along the MC-IC axis, which is quite a good position for a blogger! I also think people and countries have a way of becoming their charts if used long enough, however dubious the origin of the charts. This is because astrology is divinatory, and what you are doing is making a kind of energetic link between the chart and the person/country, and that link deepens the more you use the chart. There is some evidence for 4pm. And with Moon conjunct Pluto, Scorpio Rising and Sun in the 8th, it gives a very Scorpionic chart, for which I argued in the same blog 2 years ago. Interestingly, it has good synastry with Barrack Obama. For example, his Scorpio MC conjoins the US Scorpio Asc, and his Saturn conjoins the US Moon-Pluto. By transit we see the US beginning a square from Neptune to its ASC: its old way of expressing itself (ASC) through the use of power (Scorpio) is dissolving. The Progressed MC (the Presidency) has just moved into steady, financially aware Taurus, and out of belligerent, headstrong Aries. Prog Saturn is approaching an opposition to the Prog MC, showing the renewed sense of responsibility and authority that has entered the Presidency. The Progressed Moon in Leo is approaching the Prog Asc: the people (Moon) have found their essential voice (Asc/Leo) in electing a new president whose Sun closely conjoins the Prog Asc. Progressed Mars, the planet of America’s military ambitions, is in Libra, a sign Mars finds difficult until it learns diplomacy. This year it also went retrograde and became intercepted. So it is in difficulties, as we all know, particularly over the next 18 months, after which point it will cease being intercepted. In the arabic and medieval tradition, from Mashalah and Abumashar to Bonnati, you would drawn several charts, like the Great conjunctions, eclipses and ingress. You would also never drawn a chart for "the birth of a country". The ancients had a more sophisticated political view in this point: they looked for the chart of the beginning of the religion that founded the laws of that country. Then they would look for the chart of the beginning of the dinasty. For example, for the USA, astrologers who use medieval and arabic tradition take the aries ingress in 1789 as the base chart. Not in any moment of history or any traditional author, anybody at any time commited the absurd crime of taking the angles of an ingress and then "put the planets of the day". So, to warn visitors not familiar with medieval astrology, this is an invention of an astrologer who probably didn´t grasp, or didn´t care to fully understand, the rules of traditional astrology, and thought that it could invent the music while he was singing it, creating a chimera. I think the 2 July chart just feels right. I focus on the opposition between Moon/Pluto and Mercury, it seems to me to symbolise the constant dichotomies arising here. I know divisons arise in all countries, but in the USA they really are a way of life. Divide and sub-divide, then divide again! 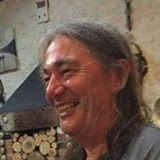 Yuzuru, I don't know the rules of traditonal astrology, but Nicholas Campion is a good scholar, and he wouldn't have given weight to Susan Manuel's paper without good reason. So I think there may be aspects of medieval and traditional astrology you aren't aware of? Interesting expression - 'absurd crime'! Twilight, how about the Gemini Rising Chart for the constant dichotomies? That chart is symbolically derived, using Uranus as the ruling planet of the Declaration, so putting it on the Asc. There a lot of aspects of medieval and traditional astrology that we are not already aware of. That doesn´t mean that I, as an traditional astrologer, can´t recognize an absurd when I hear it. It is a very simple matter... you use the planets in the ingress, simple, you don´t use the angles of the ingress and the planets of another. It doesn´t even make sense. But it is your right to believe what you want. I just put my warning on the comment to any sincere student who may be mislead to think that such nonsense is traditional astrology. OK. Sounds like I'd better email Nicholas Campion and ask him for a source for what he says! He seems to think "it is entirely consistent with medieval tradition." Also, Nicholas Campion is a historian, and has just published a history of western astrology from 30,000 BCE to the 17th century. So he is not just a modern astrologer. Let's see what he says! Gemini rising chart would be better if Moon and Mercury were in a tighter opposition, a different timing would fix that, but yes, it has a lot going for it, Uranus on the ascendant is very apt. I still prefer your Scorpio rising 2 July one though. Scorpio rising fits the paranoid-ness I sense from Americans in general, their patriotic intensity, and it has the tight opposition as well. Hi Dharmaruci, regarding your comment about how we read charts and it not being an exact science, I thought you might be interested in an article by Liz Greene on astro.com 'How we read charts is how we view life'.